It seems that forming figurative shapes out of natural materials has always been with us. As humans developed, a bigger, more sophisticated brain allowed for more processing power and higher functions such as language and creative expression. Prehistoric art covers a period from the Stone Age through to around 10,000 BC. Cave painting, rock engraving and small sculptural carvings are the most common finds. Prehistoric artefacts have been found in the all of the early cradles of civilization – this is the history of us all. 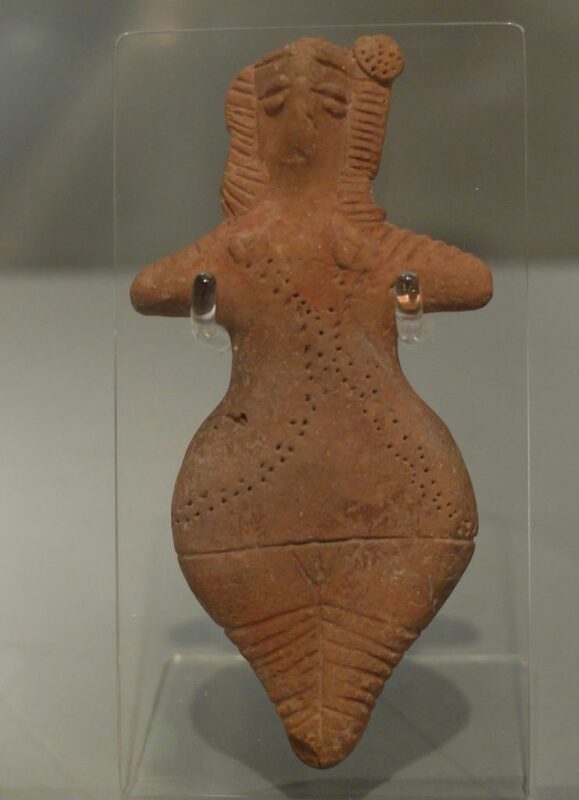 Small, hand-held female figures are the first evidence of sculpture. Usually carved in stone, bone or ivory. 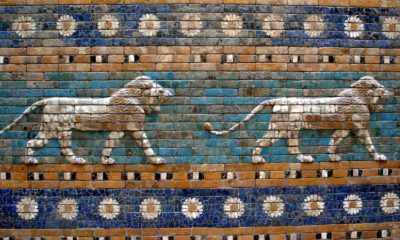 We cannot know the exact meaning, use or history of the earliest sculptural objects, but there is evidently great effort, skill and care involved in their production. This portable art is, of course, more likely to be broken or destroyed, so we don’t see a huge amount. 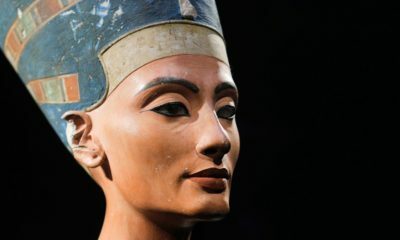 However, art historians generally agree that with early female figures (of which around 100 have been excavated) there is probably a totemic, fertility aspect. 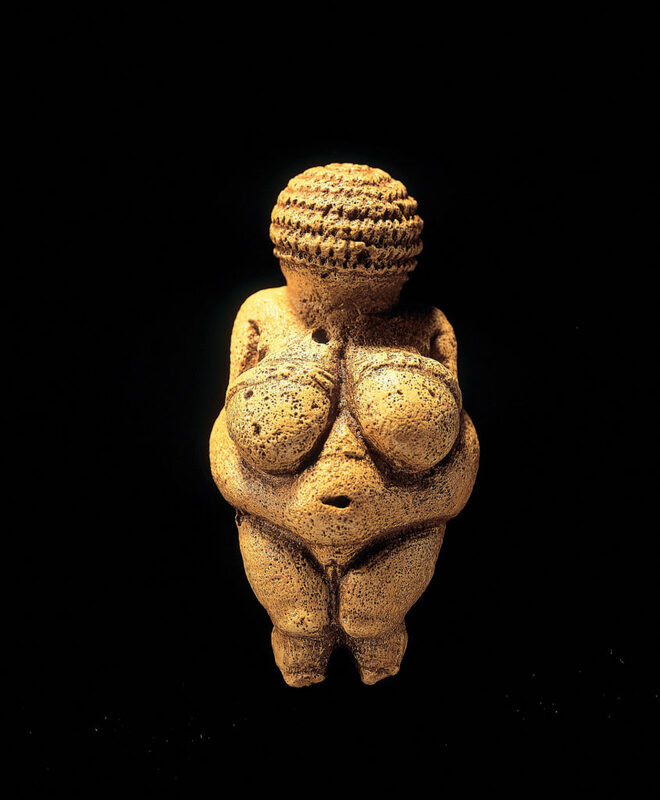 They are often referred to as ‘Venus’ figures as they were found almost exclusively by Western archaeologists whose idea of beauty was narrow, white and male. 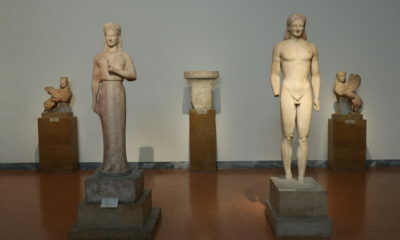 I suspect the figures they found are much more potent than the coy, simpering Venus of Western art history! 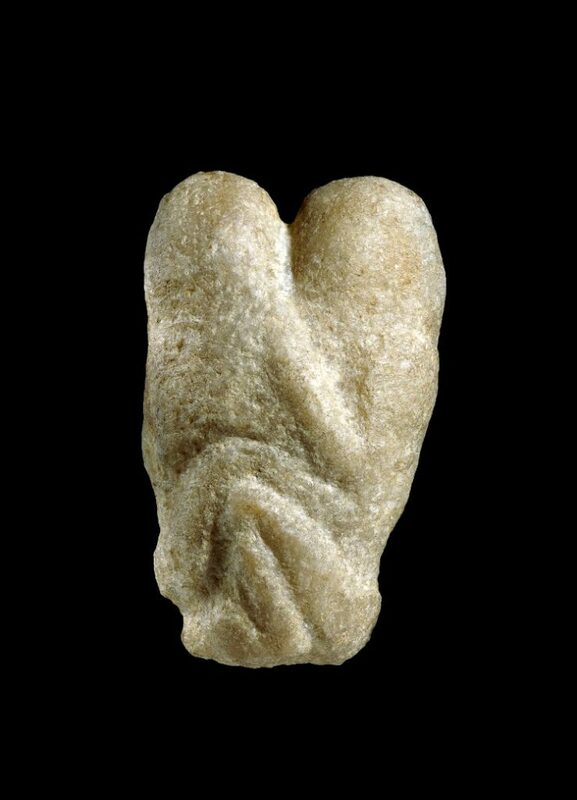 The Venus of Berekhat Ram and the Venus of Tan Tan are both pre-Homo sapiens, at somewhere between 200,000 and 700,000 years old. 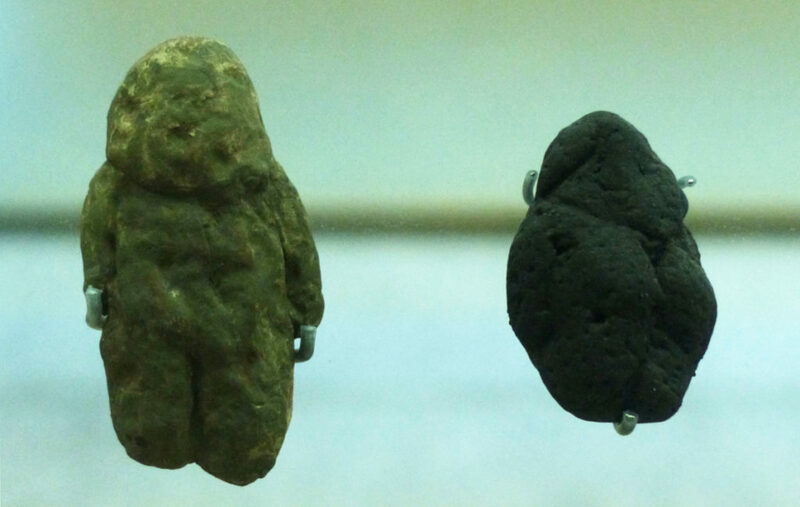 By comparison the youthful Venus of Willendorf shown above is just 25,000 years old – significantly later but much more well known. If you’d like to have a go at sculpture yourself you don’t need any special tools. Get a cheap bar of chunky soap and carve it into a simple shape with something as simple as a butter knife or a paper clip. It’s a lot of fun! From a similar time period to the Willendorf this Punjab figure with applied ‘split pellet’ eyes is made of terracotta. 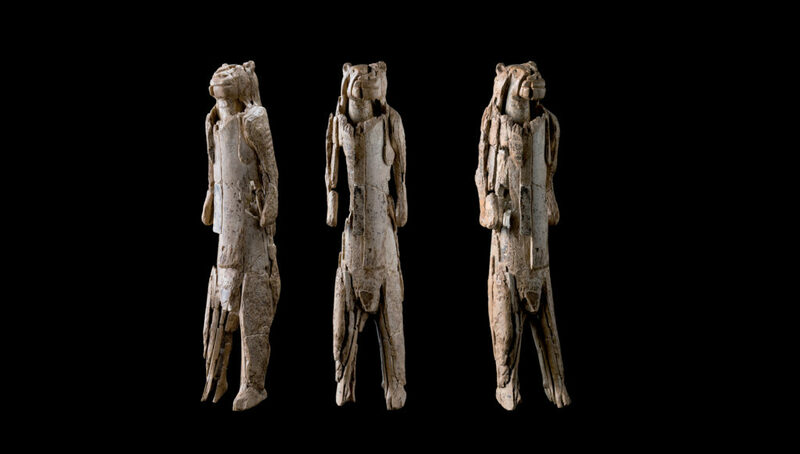 There are also some anthropomorphic and animal figures to be found, but we don’t know if these relate to food, lifestyle, cultural or spiritual beliefs. 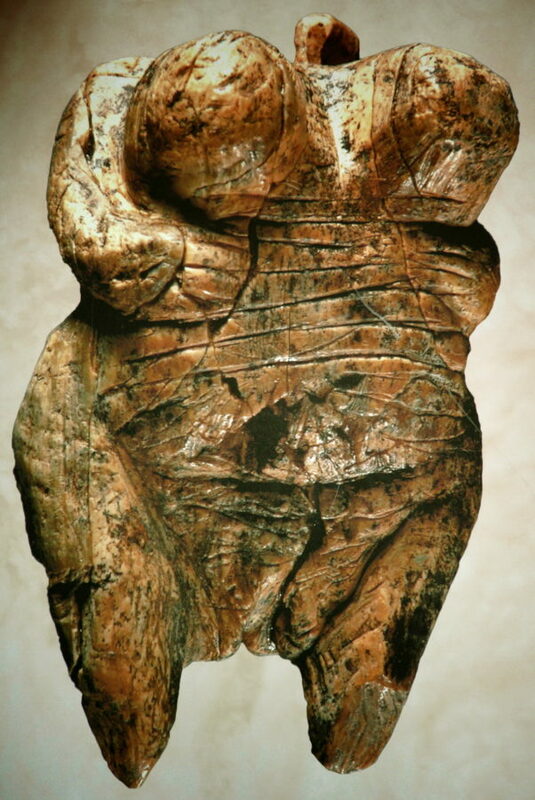 The Lion Man of Hohlenstein-Stadel is the world’s oldest known zoomorphic (animal shaped) sculpture. 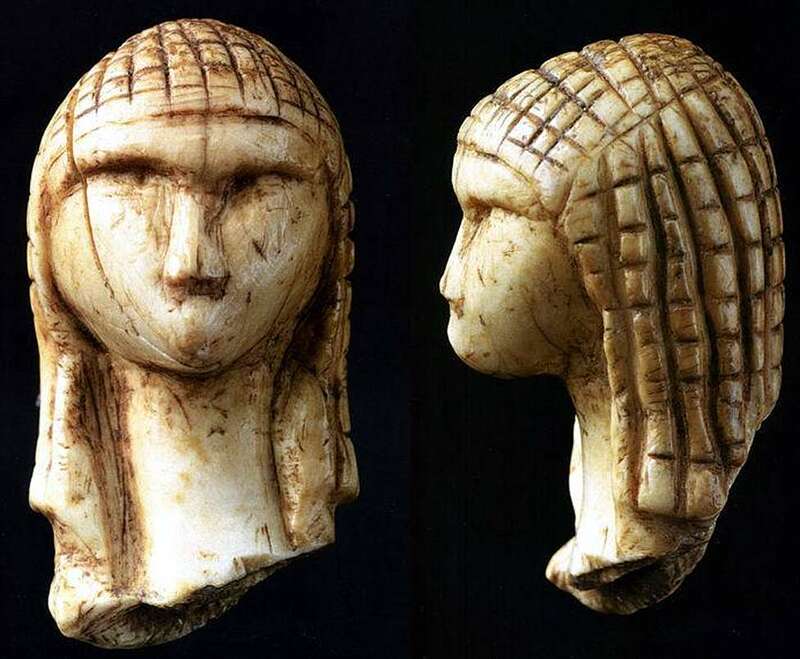 It is 35,000 to 40,000 years old and carved from a woolly mammoth ivory tusk using a flint stone knife. 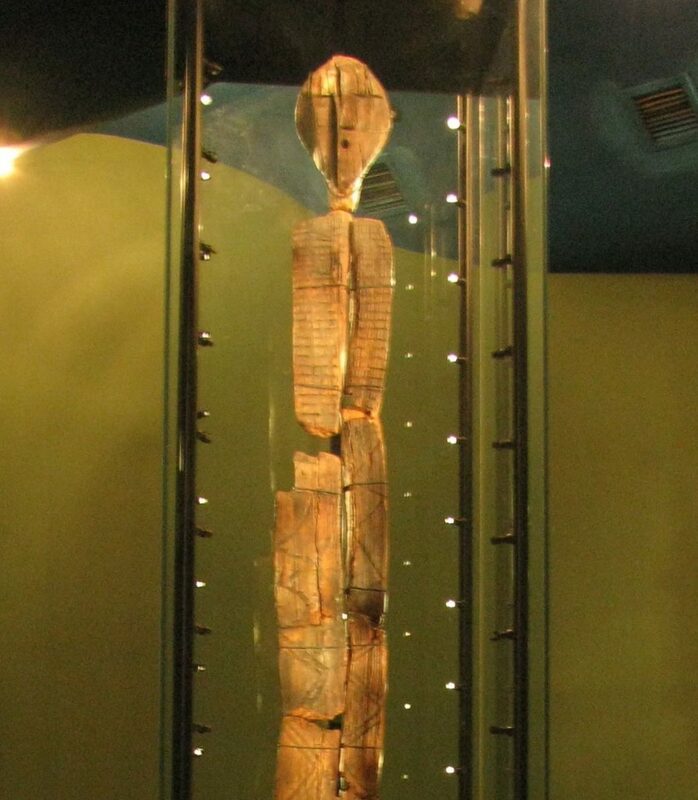 The Shigir Idol, at 11,000 years old is the most ancient wooden sculpture in the world, carved from larch using stone tools and animal teeth. It is believed the statue would originally have stood at just over 5 metres tall and seems to have been carved to be viewed, like modern sculpture, ‘in the round’. The Swimming Reindeer is a very complex piece of art. At 13,000 years old this is the oldest piece of art held by any British museum or gallery and is kept securely in a controlled atmosphere. 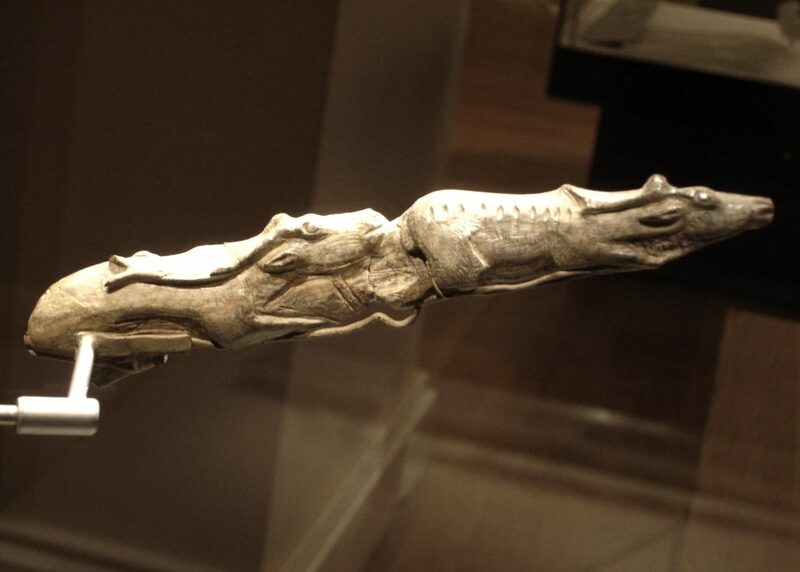 Showing a male and female reindeer, swimming nose to tail, it is known to have been chopped with a tool, whittled with a stone knife and scraper, precisely incised with an engraving tool, then polished with powdered iron oxide and buffed with leather. Another British Museum piece is the Ain Sakhri Lovers. A natural calcite cobble has been picked at with a stone point to represent two figures embracing, face to face, in a sitting position. It is the oldest known representation of a couple making love, although the genders are not identified. These tantalising objects enthral us but offer up few of their secrets. 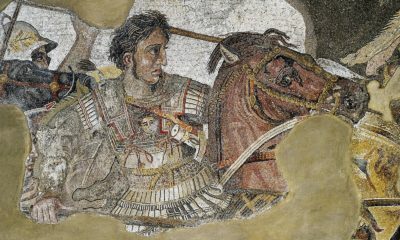 The art historian can at best tell us about tools and materials, but they cannot dissect the lives and dreams of these ancient artists. However, I think we can say that the prehistoric artist, just like the modern artist, is trying to send us a message about their own (and their community’s) inner life. There is a spiritual dimension here – an expression of place in the Universe (whatever we mean by that) and hopes for the future – survival, longevity, and fertility in its broadest sense. Noted art critic G.A. Stevens said this ancient art is the most pure, most sincere form of art there can be. 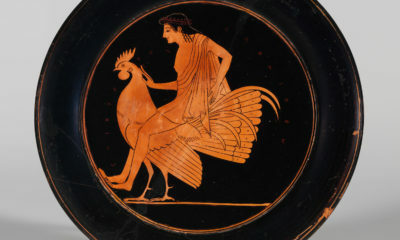 For more on prehistoric goddesses see Alexandra Kiely’s article.